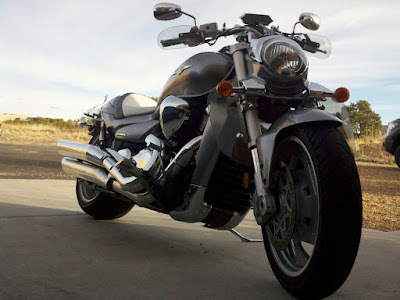 The Suzuki M109R2 is a beast of a cruiser. 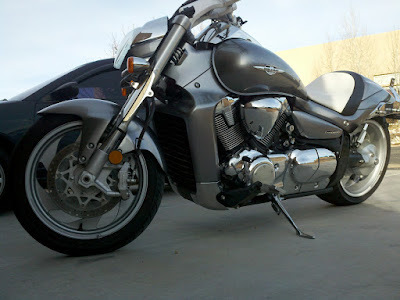 This bike is a lot of fun, and provided the wife and I with lots of enjoyable miles on the New Mexico highways and biways. As is the norm with me, I just can't leave enough alone. 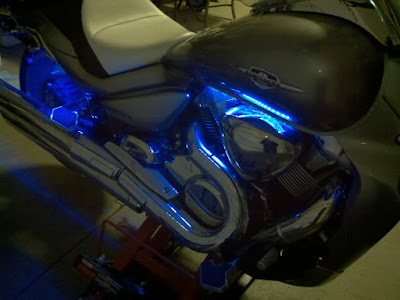 Being the gear-head that I am, I had to start tinkering with the bike, making it better and customized for my purposes. Choice of Black or Chrome housings. ***Dakota Digital Instrument systems are normally shipped from the factory with "0" miles on the odometer. If you would like mileage added to the odometer, this can be done at the factory for a charge of $20. Please contact Dakota Digital to arrange this service. In installing this new Digital Instrument cluster, some research needed to be performed on the current setup to better understand the setup from Suzuki. I took apart the Suzuki cluster to inspect it and better understand the wiring and light cluster. Here is the real meat of the operation. These schematics will provide a better understanding of what you are looking at. Please remember that from year to year, Suzuki may change the color of the wires. So, this Schematic may or may not work for you. Please work on your own bike at your own risk. I'm not suggesting that you perform this kind of work on your bike, and I'm not providing guidance for your to work on your bike. What I'm showing you is what "I" did on my bike at that time to install a different instrument cluster. 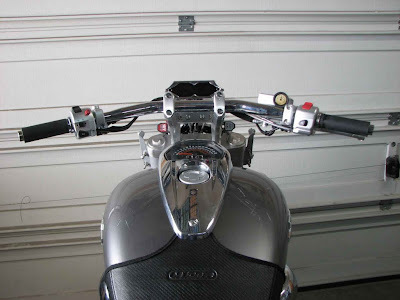 Comments and responses from a thread I posted up about this setup on M109riders site. 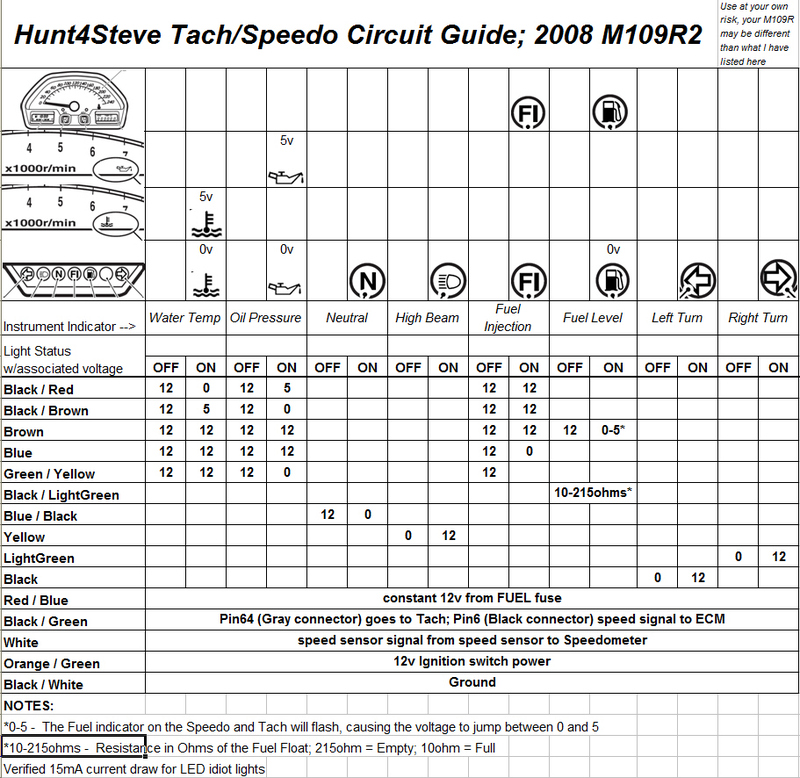 The tank speedo will remain in place due to the bike being under warranty, AND the tank gauge provides important information regarding diagnosing the computer, such a engine codes. I wanted to have the factory gauge in place so that there would be no issues if I had to take the bike in for some mechanical issue while it's under warranty. They (Suzuki mechanics) can easily view the mileage on a factory gauge and not have to question if it's correct or not. So, to answer your question, the factory tank gauge will remain in place and will remain fully functional with the fuel level, engine codes and speedo. So far the DD gauge appears to function very well with the Suzuki. I tried a few things to set the mileage myself, but was unable to get the mileage increased or "caught up" to my current mileage. So, I removed the gauge and sent it back to DD to have them set the mileage for me. I just receive it back from them so I will get it mounted this week and calibrated again. In truth, the only thing one really needs to calibrate on the DD is the Fuel level. This needs to be programed using the "Custom" settings. This is easily done with an variable resister that ranges from 10ohms to 220ohms. The voltage is already preset to flash the battery indicator is the voltage drops to 11 volts. The oil pressure is already preset to come on if the engine looses oil pressure using the factory oil pressure sending unit. The MPH are easily setup with the correct wiring, however I do have a "DD Speedometer Adjustment Module" in line to assure that I can fine tune the Speedometer to match any newly installed tires to my GPS reading. The DD gauge has a adjustment option that will allow you to increase or decrease the viewed speed. For example, I have a GPS unit that I have attached to my handlebars and gives me an accurate speed as I'm traveling down the street. Following the instructions, I was able to fine tune the DD gauge to match the GPS speed. This is great to get the DD gauge accurate, but we all know that the factory speedometer is usually off by about 7%. To fix this, I installed a DD Electronic Speedometer Adjustment Module inline with the Factory speed sensor. Putting this sensor in place allows me to control the speed to both the Factory speedometer AND the DD gauge. Once I get the Factory gauge corrected, I then can use the DD Gauge's built in adjustment to fine tune the DD gauge speedometer. When I setup the Speed setting, I did not use the "AUTO", but rather used the "ADJ" selection. This made it easy and accurate when adjusting the speed to match the GPS reading. It should also be noted that the "PINK" wire coming from the speed sensor is the one you want to tap into. The "Orange/Red" wire provides the 12 volts to the sensor, and the "Black/White" wire provides the ground. When the sensor is activated, the sensor fluctuates between 12v and 0v. 1. The speed sensor has a 3 pin connector. Cut the signal wire wherever you have access to it. Splice the wires of the SIM-1M into the speed sensor wires as follows: SIM-1M wire sensor side RED sensor power BLACK sensor ground WHITE sensor signal SIM-1M wire speedometer side RED speedo sensor power BLACK speedo sensor ground YELLOW speedo sensor signal. 2. The SIM-1M will now be in between the speedometer and transmission speed sensor. Calibrate the speedometer. (see steps below). 3. Secure the SIM-1M into the harness on the bike so it is not hanging loose. 1. Follow a vehicle going at a set speed or time yourself driving one mile so you know what your speed should be. 2. Press and hold the UP or DOWN button while you are driving to change the speedometer reading until the speedometer is correct. The bike must be moving in order to adjust the speedometer. When setting the Tach setting, this was pretty straight forward; 2 cylinders. I used the "Normal" voltage Tach signal selection with no issues of the DD gauge reading the Tach signal. Setting the Gear was a pretty straight forward following the DD instructions. I did perform this setup and was successful in getting the DD gauge to show the correct gear as I was accelerating through the gears. To me, this is the most important aspect of changing gears, the up shifting and knowing where I am in the up-shift of the gear travel. When slowing down and coming to a stop, the gears don't quite match up to the gear in use during deceleration. However, that's ok, I don't mind this little issue. I didn't even look at this setting, as it wasn't relevant to getting the DD gauge working with the M109R2. Following the Volt setup, I set the voltage warning to 11.5 volts. This is pretty straight forward. A full tank of gas has a resistance that measures approximately 10 ohms. An empty tank of gas has a resistance that measures approximately 216 ohms. SET 00 on the DD gauge would equal 215 ohms, or an Empty tank. SET 33 on the DD gauge would equal 146 ohms, or 1/3 of a tank. SET 66 on the DD gauge would equal 78 ohms, or 2/3 of a tank. SET 99 on the DD gauge would equal 10 ohms, or a full tank. Following this setup, I then used a siphon to drain the tank while watching the Fuel level on the Factory Speedometer cluster and the DD gauge. The Factory Speedo cluster's Fuel meter dropped accordingly, but the DD gauge would not move. I then attempted to reverse the programmed resistance to the settings...again, no deal. So, for now, I just chose to use the "SWITCH" setting in the Fuel menu. This Disables the DD gauge Fuel meter. So, for now, I'm using the Factory Speedo Cluster Fuel meter, which works as it should. I could invest more time in this, and maybe later I will, but for now, I want to get out and ride. I use the "Switch" setting so that I could use the Factory Oil sending unit, as directed in the DD instructions. The DD gauge did come with a sending unit, but rather than install it, I wanted to test the factory unit and see if it would work. it did. 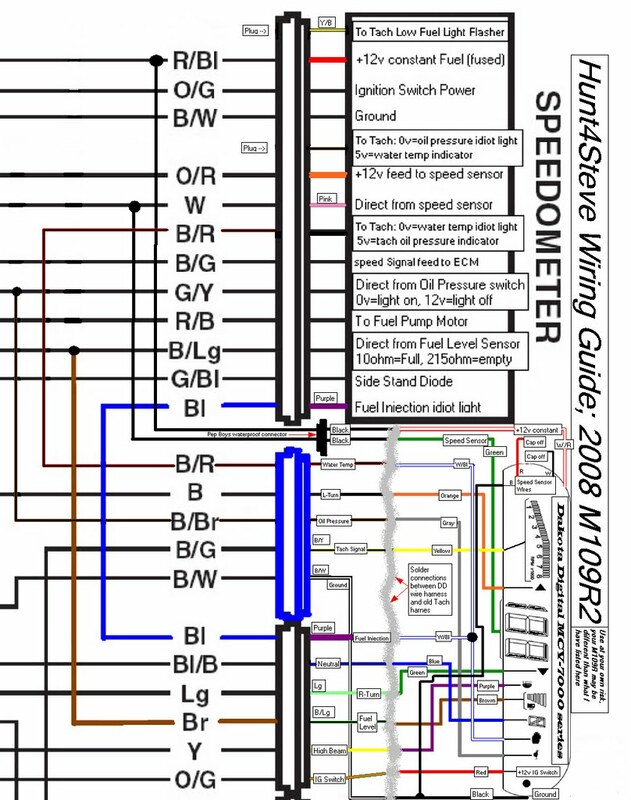 To test this, The Gray DD wire is connected to the Black/Brown Tach cluster (old wires), which is then connected to the Green/yellow wire that goes to the Speedo cluster. Now the interesting thing about this wire is that when it is supposed to be ON, the voltage is 0-volts. When the light is OFF, the voltage is 12-volts. You may question if this really works, and it does. To test this, disconnect the wire from the oil-pressure sending unit that is located next to the oil filter. When the connector is grounded, the light will come on, when disconnected, the light will go out. For further instructions check out the factory service manual; Electrical System, section 10-38. With the engine running, it all works correctly as it should. Self explanatory, I set it for Auto, which seems to work correctly. There is an "ENGINE" indicator on the DD gauge, which I hooked up to the Water Temp indicator and the Fuel Injection indicator. In testing these functions, I used 50 ohm resisters up to 500 ohm resistors, to simulate the temperature fluctuation of the water temp. It worked great, and displayed the engine light when appropriate. Noted something interesting this past weekend. I filled up my gas tank and noted that the gas gauge on the Factory Speedo cluster indicated the tank as Full; as it should have. Since I switched the DD Fuel gauge off, there was no indication of the Fuel level on this gauge. After riding for a few hours, I noted that when the gas gauge on the Factory Speedo indicated one bar left on, the gas-pump indicator started flashing. When this started to flash, I ALSO noticed on the DD gauge that a gas-pump indicator lighted up. Sorta interesting. So, with the current setup, at the very least the DD gauge will show that you are low on gas, and have about 40 miles to go before you run dry. Pretty nice indicator despite the DD gas gauge being disabled. As for the pictures of the daylight and night riding, they are coming. Suffice it to say, I was able to see the all the indicators on the screen with no issues, even in direct sun-light. So, I've been riding quite a bit lately and it has come to my attention that the Suzuki Factory Speedo and Odometer are crap. The Speedo is off considerably, which of course throws the Odometer off. I have matched my DD gauge to a GPS unit that provides speed readings. Since the Suzuki Speedo is so far off, the difficult part is getting the DD Odometer to match the Suzuki Odometer (or vice-versa), and then getting the DD speedo to match the GPS unit. The Factory speedo really is a joke, at this point I don't care what it reads in terms of how fast I'm going, just as long as the Odometer is tracking correctly, and in sync with the DD gauge. However, that aside, the DD gauge is working flawlessly. When the Factory gas indicator drops to one bar, the gas indicator on the DD gauge comes on. I have noted on several occasions that when this condition is met, I have stopped for gas and put in approximately 3.5 to 3.7 gallons of gas. This leads me to conclude that when the gas gauge comes to the last bar and the DD gauge gas light comes on, I have approximately 1.5 gallons left, which should get me at the very least another 40 miles. This gives me a little more comfort in terms of getting down the road to the next gas station. On a recent ride to Red River i decided to test this little scenario. The DD gas indicator came on, and I figured I had at least another 40 miles to go before I ran dry on gas. The GPS showed that there was a gas station about 27 miles up the road. I pushed on to that gas station. When I filled up, I put in 4 gallons. Having the extra gallon in the tank left me feeling more confident about the DD gas indicator and the distance I can travel when the gas comes on. So there may be a question as to how to sync the Odometer on the Factory Cluster and the Odometer on the DD Gauge. What I have found is that this takes some time to get in sync. 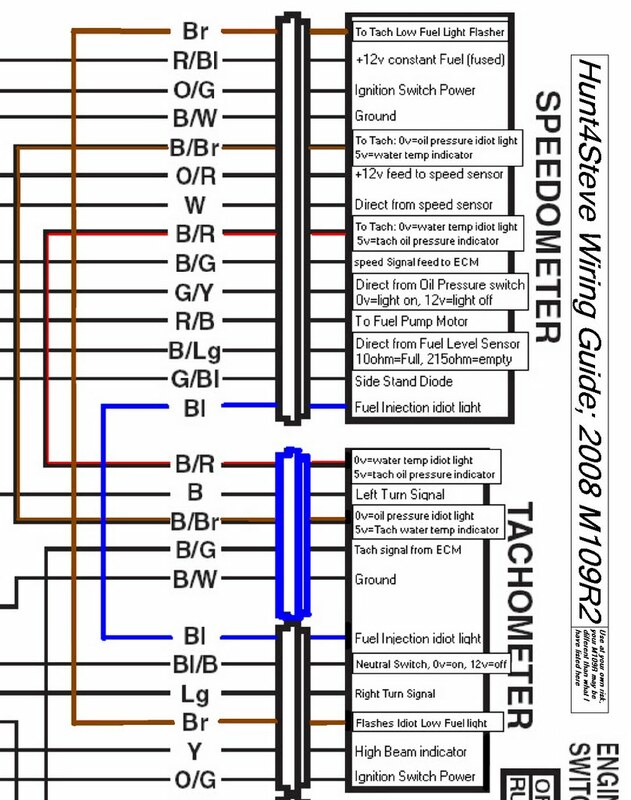 I have a DD Electronic Speedometer Adjustment Module that is wired just after the VSS on the bike. This will allow you to have a master speedometer control to both the Factory Speedo/Odometer and the DD Speedo/Odometer. The DD gauge has a built in Speedo/Odometer control that will allow you to perform the same function as the Electronic Speedometer Adjustment Module listed above. Another item you will need is a GPS unit that can be clamped to the handle bars, this is what the DD gauge Speedo will be based off of. The DD Gauge will become the MASTER Speedo/Odometer reading, as this is what will be matched to the GPS speed reading. The DD Electronic Speedometer Adjustment Module is really there to adjust the Factory Odometer (not the speedo - which is inaccurate) and match the DD gauge Odometer. 1) Use the DD Electronic Speedometer Adjustment Module (hereafter; DDESAM) to MATCH the DD gauge speedo to the GPS speed. This will ensure that the DD gauge, which will become your master gauge, is accurate. 2) over several days and miles, note the increased Odometer reading on the Factory cluster, in relation to the increased Odometer reading on the DD Gauge. Use the DDESAM to increase the speed output, THEN use the DD gauge settings to decrease OR match the speed of the GPS. Use the DDESAM to decrease the speed output, then use the DD gauge settings to increase OR match the speed of the GPS. Following the above methods, eventually, you will get the Odometer mileage to match the DD gauge Odometer reading. This will take some time and some miles to get the gauge's Odometers to match up. Forget about using the Factory speedometer, this is very inaccurate. In fact, the Speedo doesn't match what the Odometer is recording....pretty lame.